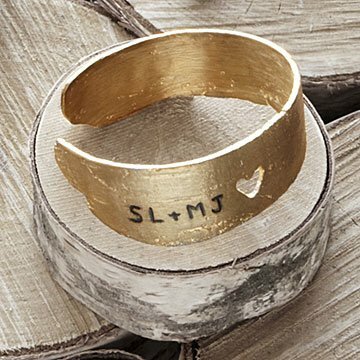 Cast from birch bark, this brass cuff evokes the romantic tradition of carving lovers' names into a tree. You can almost hear the rustling of leaves on a summer day as you don this nature-inspired cuff. Each one is custom engraved with two sets of initials, continuing the romantic tradition of carving lovers' names into bark (without harming a tree). Jewelry artist Nancy Nelson hand casts the brass band from real birch bark that she collected along the southern shore of Lake Superior in Wisconsin. The detailed texture of the bark evokes the rich, spontaneous stroke of an artist's brush. The understated heart cutout pairs beautifully with the birch tree's traditional symbolism of protection and resilience. Handmade in Maryland. Clean with a polishing cloth. Keep in an air tight bag or jewelry box to prevent tarnishing when not wearing. I turn to Uncommon Goods for unique gifts when I'm stumped on what to get. Bought 2 other items at the same time, and those have also been well received. This cuff bracelet is perfect for anyone looking to give a jewelry gift with some sentimentality. It has just the right amount of personalization for everyday wear, yet still makes a bold statement about your relationship. I love the birch bark design, as it is not a perfectly smooth service which gives it more character. You really can't go wrong with this one. My husband, who has been my best friend for more than 30 years, gave this to me for our last Valentine's Day gift before we married last year. I absolutely love it!! I wear it everyday and I receive lots of complements and inquiries because of how stylish and unique it is. This was a very nice gift, my wife loved it.